We know that the Buddha taught becoming one with everything. But where to start? Here is a sample box with all 11 fine kinds of Hari Tea to explore. And experience. 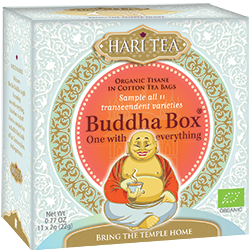 This Buddha Box offers you a great opportunity to get acquainted with all the fascinating Hari Tea flavors and various traditional mixtures of organic herbs and spices.